For most of us, living ocean front in Manhattan Beach or Hermosa Beach is unrealistic and unaffordable. Prices generally start in the multi millions and the few Strand “fixers” that are still out there are usually quickly bought up by developers and builders. Redondo Beach is different, however, as zoning has made for larger condo complexes, many with great views, and almost all far more affordable. 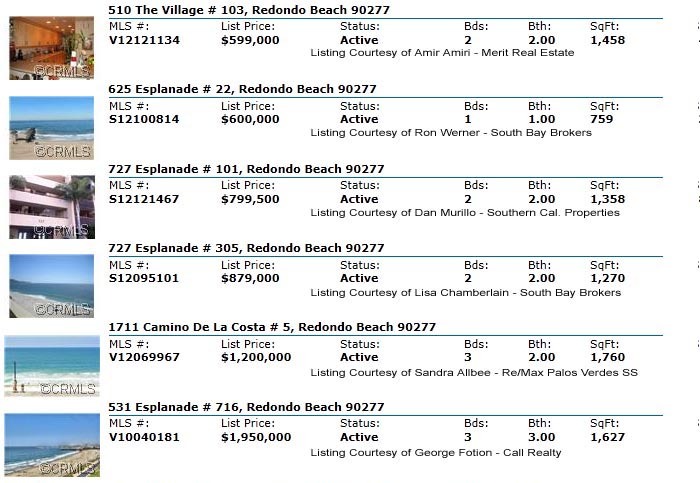 As of November 6th 2012, there are currently 6 condos on the market….most with spectacular ocean views. The most prominent areas to find ocean view condos in Redondo Beach are the Esplanade, the oceanfront street in the cities southernmost area, and The Village and Seascape which are a series of buildings built in the 1970s that generally overlook King Harbor. Click here for more details on the current oceanview condos and for current listings.